This mod is only demo. It contain a 2 cars Nissan 350Z and Nissan 240SX. In full version it will have a 113 street non tuned (and tuned) cars. 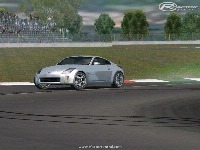 1.1 Nissan 350Z Fixed Brakelights and added Interior. This is second beta. It include 5 cars such as Porsche 997 GT2, Alfa Romeo Brera, Chevrolet Camaro SS '67, Mitsubishi Lancer X, Acura NSX, and one Gran Turismo Pace Car. This cars dont have cockpits and proper physics but it showes how this mod will be look when its done. Here is a physics fix update to make available cars more realistic in motion. Thanks to lacase for this update. There are currently no setups for Gran Turismo. Add a Setup.